KONGA (1961) has the dubious distinction as gorilla man George Barrows most widely known film, yet, he was not actually in the suit for the AIP produced, English KING KONG knock-off. When KONGA was shot, the British film industry had very strict conditions for foreign professionals working on English sets. Barrows apparently ran into some difficulties with red tape and was unable to travel to the UK in time for the shoot. According to Bob Burns, fellow gorilla man and good friend, George ignored his better judgment and sent over his superbly crafted suit without him. When the suit was shipped back after production ended, George was horrified to find the delicate head mechanism busted and the general condition of costume deplorable. 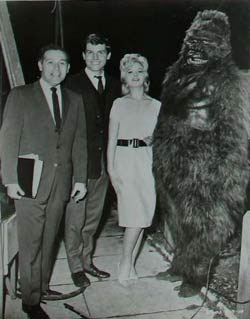 Apparently, some stiff without any costume work experience was stuffed into the suit and told to make like an ape. The money earned from KONGA went straight to repairing the rough treatment his poor ape suit received from the Brits.